Opening the DissertationTeam.com website’s home page takes you to a tidy, clean page which is well set out and logically presented. Dissertation Team has been around since at least 2010 and are based in the UK. They are part of a large group of essay writing companies called Global Writers LLC. Comments on DissertationTeam seem broadly neutral as to its reputation and scope in the marketplace. DissertationTeam.com aim to serve just the higher academic strata with this bespoke service aimed at dissertation and thesis business only. At this rarified level, it is necessary to employ good writers to gain and maintain a good reputation in the field - Dissertation Team, (according to their customer reviews) do not really seem to have achieved this. The products are a standard list of services covering essay writing, dissertation and thesis research, results papers, arguments and so on. Oddly, when ordering their services Dissertation Team state that you have the option of choosing a writer or allowing them to select one on your behalf after having taken into account the details of the task needed. However, although their Dissertation Team testimonials show close cooperation with the writers, in the FAQ section of the website it clearly states that the writers are reluctant to have direct communication with their clients and prefer to remain confidential. This seems incongruous, and we would want to look more closely at the authors and their performance, see results and have independent feedback before we went any further here. This service says that they can, “sometimes” let you see and examine the writer’s credentials so that you can confirm the veracity of the claims made on their behalf. But, really, should it not be a given, that at this level of assignment, and at the prices being charged here, that you should be given access to such important information? We think so. Prices are shown in a tabular format, and are based on the deadline available, the number of pages needed, and the academic level of the assignment - it seems to make no difference to the pricing as to what subject is being written up. By way of example, a 10 page, undergraduate assignment with a fifteen-day deadline would cost $243. Payment is by all of the normal credit cards and PayPal. The system is fully encrypted and Dissertation Team guarantees that it neither collects nor disseminates any customer or credit card information. Interestingly, there are absolutely no mentions of any discounts by DissertationTeam at all! DissertationTeam.com coupon codes are non-existent and make their pricing way up at the top end of the spectrum. On looking at DissertationTeam.com review sites, this was mentioned quite frequently. 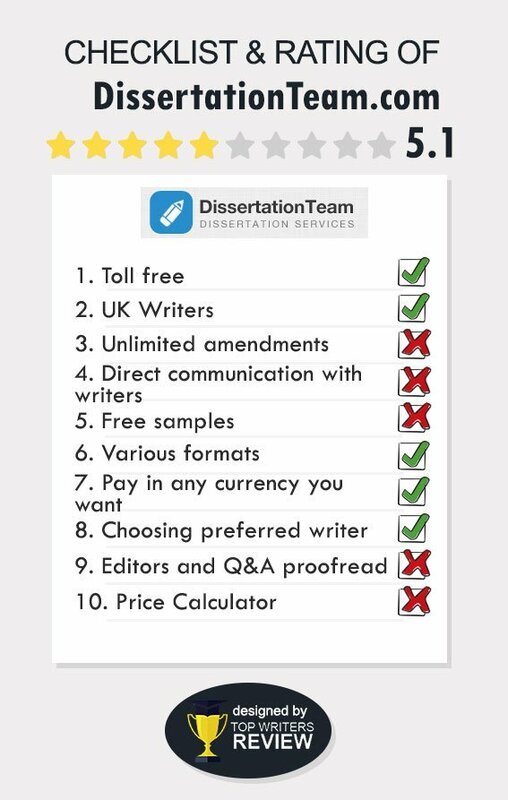 There are actually some free features in the Dissertation Team roster; these include unlimited revisions, (with provisos, of course) bibliography, plagiarism report, title and outline pages. Dissertation Team does state that there are further freebies, but, aside this statement we could find no further details of any. Ultimately, what we have here is a company which charges top end prices, offers no discount whatsoever, no coupon codes, no loyalty or quantity discounts or any kind of rebate or deduction. So; all you have is high prices and claimed academic excellence. DissertationTeam.com pros & cons in this case lead us firmly into cons territory. There is no Dissertation Team BBB, (Better Business Bureau) affiliation and the claims for the validity of the writers, their capabilities, and their qualifications are a little open to question. Independent Dissertation Team rating sites may shed some light on this. We would look very carefully at the competence, fitness, and at an independent review of Dissertation Team, and it’s writers, before committing large sums of money to getting an assignment completed here. Where is the promised quality of the papers? I couldn't find it in my term paper! It was full of mistakes, illogically structured and what is more, it was not delivered on time. The impression the company has left with me is generally negative. They are not good at the level of writing they promise. It's good for school essay, but not a dissertation or thesis. You won't get a degree with their help.